Surveillance video captured the escape and shows the shooter running down an alley to the waiting car. He stops at the car for a second and then hops inside the passenger seat while the driver floors it. The woman was interviewed by LAPD detectives two days after the murder but wasn’t arrested. Law enforcement sources said at the time, “Sometimes you have to give a little to get a lot,” which led to the conclusion they were getting inside information from the driver. However, it’s unclear what kind of information they’re after. There were plenty of witnesses to the shooting. Police still need to determine if the woman knew the alleged killer was intent on murdering Nipsey. At the time, she insisted she had no idea he was armed or had plans to shoot him. Complicating things even further, when the car arrived at Marathon Clothing, Holder was driving and the woman was the passenger. He then parked in the strip mall parking lot next to the store. As she waited in the car, Nipsey and Holder had their initial conversation. Although several reports suggested they got into an argument, there was supposedly no animosity toward the end of their encounter. 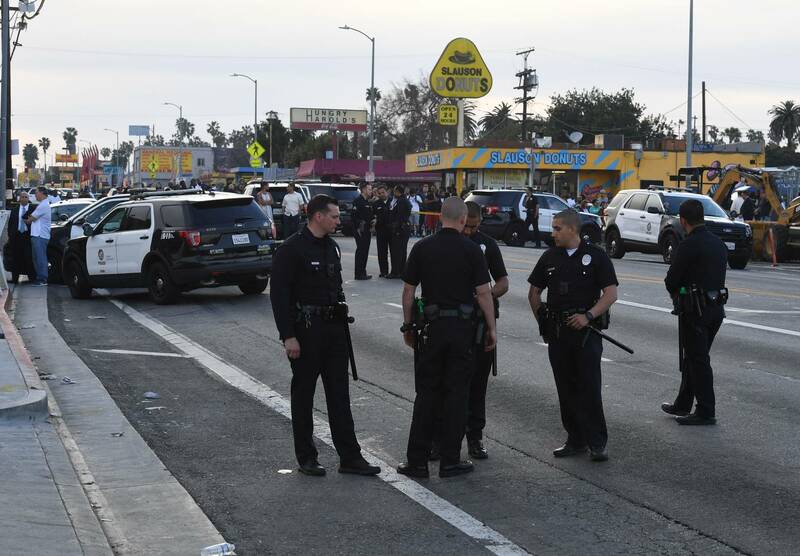 Nonetheless, the man believed to be Holder returned to the scene where he unloaded at least six shots, striking two other men and killing Nipsey. The woman, who by this time was in the driver’s seat, was waiting in the alley with the engine running. That’s when they made their getaway. The intersection of Slauson and Crenshaw — where Nip was gunned down — was also renamed Nipsey Hussle Square. 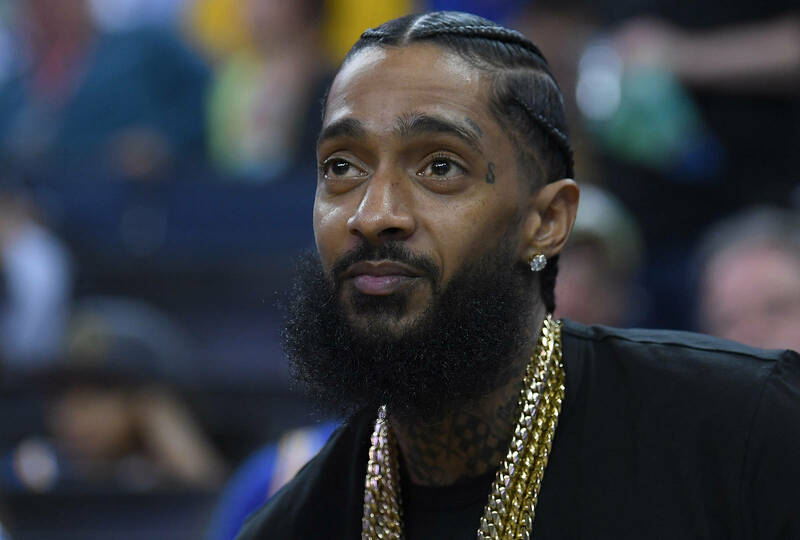 Los Angeles, CA – The Game is still reeling from Nipsey Hussle’s death but is finding new ways to honor his late friend every day. In addition to the daily Instagram posts he writes about Neighborhood Nip, Mr. L.A. Confidential’s license plate is now custom tailored with a Nipsey tribute. As the entire Hip Hop community knows, Nip was gunned down on March 31 in front of his Marathon Clothing store in South Los Angeles. Since then, the outpouring of support has continued for nearly three weeks and is showing no signs of slowing down. For starters, the intersection of Slauson and Crenshaw — where the murder occurred — was renamed Nipsey Hussle Square and his funeral at the Staples Center on April 11 was the first service held there since Michael Jackson’s death. “TMCONTINUES ♿️💙🙏🏾🏁,” Snoop captioned a photo of himself wearing the chain. The surveillance video footage that captured the moment Nipsey Hussle was shot and killed has circulated throughout the internet, yet TMZ reports that there are tapes authorities have in their possession that have not been made available to the public. What is known is that Eric Holder, the suspect in the case, approached Nipsey, shot him multiple times at point blank range, and then ran f to a nearby alley where he jumped into an awaiting car driven by a woman. Throughout the investigation, there have been reports that the driver the getaway car has been cooperative with police, alleging that she had no idea that anyone was going to get hurt, let alone killed. The driver’s identity has yet to be acknowledged publicly by police, although internet sleuths have tracked down and identified who they believe she is. She has not been arrested or charged in connection with Nipsey’s murder. Meanwhile, TMZ claims that they have watched surveillance footage the neighboring alley near the Marathon Clothing Store where Nipsey was gunned down, and according to them, it looks as if whoever was behind the steering wheel the getaway car was waiting to take f in a hurry. “You see the shooter race down an alley to the waiting car,” TMZ writes. “The killer stops at the car for a second, then gets inside the passenger seat and the driver floors it. It’s apparent from the video … the driver was waiting to bolt from the scene.” They also say that their law enforcement sources claim there is still confusion over whether or not the woman was informed the killer’s intent or if she had knowledge that he was carrying a gun. Nipsey Hussle carried around positive energy everywhere he went and you can see that from the way people have been reacting to his death. At the young age 33, Hussle was shot dead in front his shop on Crenshaw and Slauson, which is where he grew up. The majority the hip-hop world has been grieving his loss with OGs and newcomers alike feeling horrible for his family and friends. 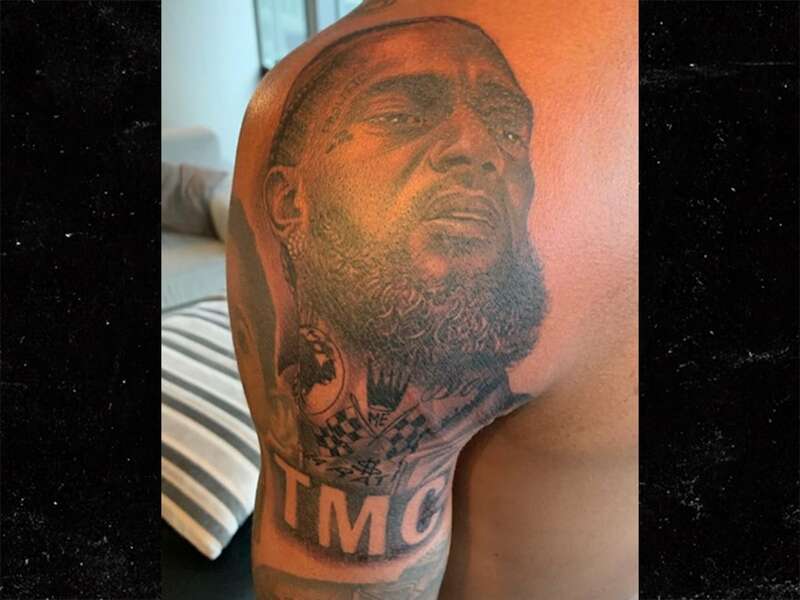 Rick Ross previously showed f his new tattoo, which honors the late Nipsey Hussle but that’s not the only way that the Florida icon plans to keep his legacy alive. While this may not be as permanent as the marking on his skin, Rick Ross will have a constant reminder Nipsey Hussle every time he travels between floors in his house because the outside his elevator doors has a picture the rapper plastered on them. He showed f the new decoration on his Snapchat page, telling his fans that the Marathon continues. Rick Ross hasn’t been alone in fering daily reminders Nipsey Hussle’s legacy online. T.I., The Game, and YG have all been contributing to the cause, posting regular photos their homie to keep him fresh in everybody’s minds. Take a look at Rozay’s latest tribute below. With it finally sinking in that Nipsey Hussle is really gone, our focus moves to maintaining his extensive legacy. Artists like The Game and T.I. have been set on keeping Nip’s memory alive, sharing photos the legend on their social pages every day. While the tributes will likely end sometime in the distant future, it’s beautiful to see how Hussle’s work affected so many people’s lives. 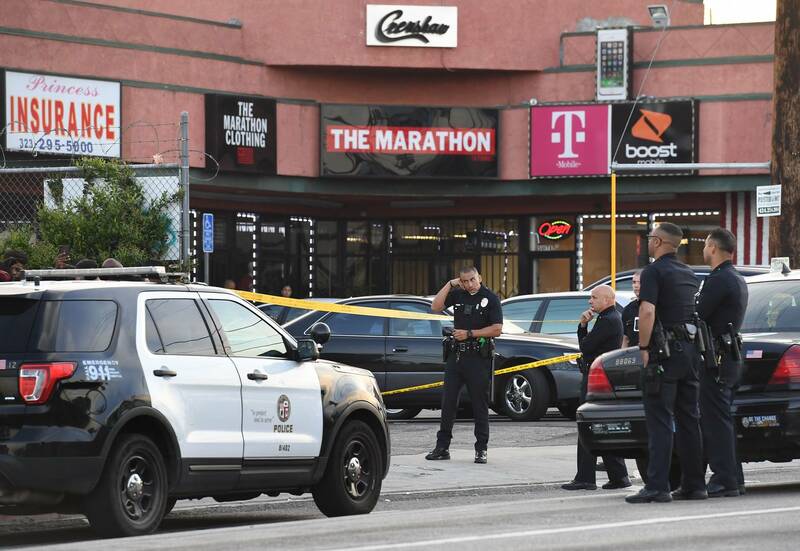 On the day his public memorial, one the men that were shot with Nipsey in front his Marathon shop was arrested for his association to the gang-affiliated rapper. It appears as though, after a public outcry for Kerry Lathan to be freed, he will likely be released from jail this week. You may recall that the only reason Nipsey had gone to his Marathon shop on the day he lost his life was to pick up some clothing for one his friends that had just been released from prison. 56-year-old Kerry Lathan was with Hussle when he got shot, also suffering a gunshot wound and being taken to the hospital. During the funeral procession, Lathan was actually arrested for his association to Nipsey. One the conditions his parole was for him not to be friends with any gang members and Nipsey was a member the Rollin’ 60s Crips. According to TMZ, the Department Corrections and Rehabilitation has ficially withdrawn their decision to revoke his parole, which means that Lathan is likely to be released from jail as soon as today. Nipsey Hussle was scheduled to meet with the LAPD the day after he was gunned down to discuss ways they could reduce gang violence in Los Angeles. We will provide updates on Kerry Lathan’s release as they become clear. T.I. and Meek Mill aren’t the only ones dropping bills at Nipsey Hussle‘s Marathon clothing store in support the fallen artist. Fans across the globe have seemingly headed to the online store for Nipsey’s merchandise and ordered a number articles clothing to not only contribute to his brand, but have a piece clothing that represents Nipsey. Karen Civil sent out a tweet letting fans and followers know to buy “AUTHORIZED items from HIS BUSINESS” if people are looking to support Nipsey and everything he stood for. One user replied, simply stating she’s still “waiting on her package” which promoted Karen to follow-up with an update. Karen has been working on the clock in support everything surrounding Nipsey since his passing, even calling out people such as Reggie Bush who seemingly started a GoFundMe page for Nipsey without his family’s authorization. “I understand you’re motivated and want to help, but there are other ways. His family already asked you NOT to do this. People are literally grieving over a husband, father, brother, uncle, friend and someone who meant so much too so many people. This is not the time for this,” she tweeted to the former football player. Cleveland Cavaliers guard Jordan Clarkson recently took to instagram to reveal a new tattoo on his left arm in honor Nipsey Hussle. The tat, done by celebrity tattoo artist Steve Wiebe, is a photorealistic image Nipsey along with “TMC” as a nod to the late rapper’s slogan, “The Marathon Continues.” Wiebe also shared some photos on his own instagram account, which you can check out in the posts embedded below. Clarkson, 26, is among the many NBA players who have spoken out against gun and gang violence in the aftermath the tragic murder. Hours after Nip’s death, Clarkson got on the mic at a Scottsdale nightclub and gave an emotional tribute. He later described to Cleveland.com how it felt like a family member was taken from him when Nipsey passed away. Clarkson’s teammate J.R. Smith has also paid tribute to Nipsey with some brand new ink. Los Angeles, CA – In the wake of Nipsey Hussle’s March 31 murder, orders at his Marathon Clothing store have skyrocketed. According to a tweet from Karen Civil, the store’s employees have been working overtime to accommodate over 2 million orders. Civil made sure to emphasize to support only “authorized” items from the Marathon Clothing. “If you want to support @NipseyHussle and everything that he stood for please make sure to buy AUTHORIZED items from HIS BUSINESS,” she tweeted along with the website. Nipsey founded Marathon Clothing with his brother Blacc Sam in 2017. It’s located at the intersection of Crenshaw and Slauson in South Los Angeles, where the Grammy Award-nominated rapper was gunned down last month. The store was apparently one of many business endeavors Nip had his hand in before his untimely death. As a result, his two children are reportedly set for life. Nipsey Hussle was a savvy businessman. The hip-hop impresario owned 14 businesses prior to his death including his All Money In record label and Marathon Clothing store. Additionally, he owned his master recordings as well as real estate. Now, according to a new report, Nipsey had also invested in a Las Vegas casino that is set to open in 2020. On Monday (April 15), Nipsey’s business partner, David Gross, revealed that he and Nipsey were approached by senior executives from Sir Richard Branson’s Virgin Hotels about investing in the hospitality space following their failed bid for the Viceroy Santa Monica. 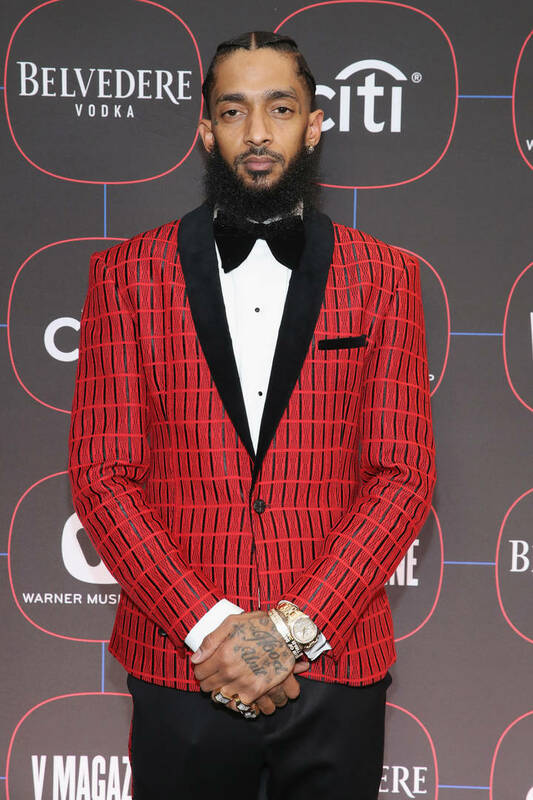 But according to Hard Rock Hotel property partner and CEO Richard “Boz” Bosworth, Gross’ report is “a big overstatement,” adding that Nipsey was a “minority investor in a partnership, which was managed by David Gross.” The rapper invested as part of a collective called the Confluent Group, which also includes Carmelo Anthony. The Hard Rock Hotel & Casino Las Vegas, located roughly a mile east of the Strip, is set to undergo a $200 million transformation to turn it into the Virgin Hotel Las Vegas. When complete, the property will feature 1,504 guestrooms, a 60,000-square-foot casino, and several pools across five acres, according to Casino.org. Nipsey had invested in multiple businesses to ensure his financial security. Following his passing, his family has respectfully turned down charity offers. He reportedly set up multiple trust funds to make sure his kids and family would never need a handout. In addition to running his popular Marathon Clothing store, he was also involved in Destination Crenshaw, a beautification project to turn a 1.3 mile stretch of Crenshaw Blvd. into an open-air art museum. Nipsey Hussle continues to make moves on the Billboard charts following his untimely death. The last single he released while he was alive, “Racks In The Middle,” has secured a spot in the top 10 on the Billboard Hot Rap Songs, according to Billboard. 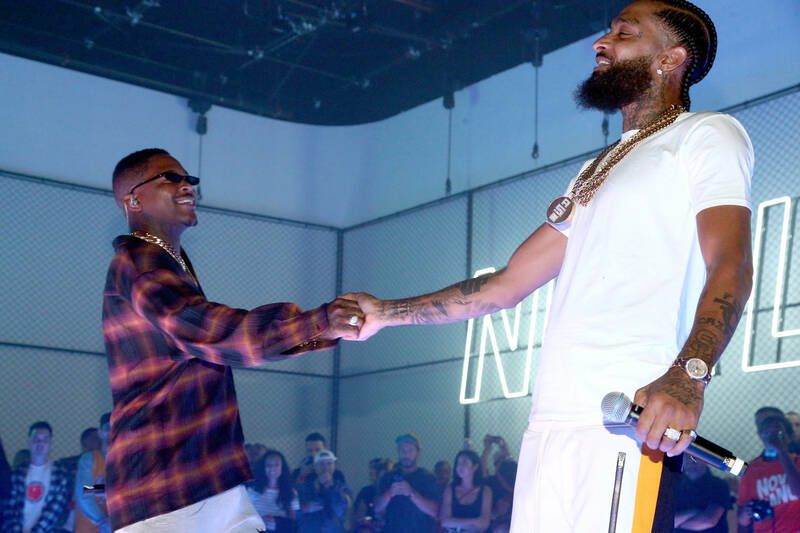 The single, which features Roddy Ricch and Hit-Boy, marks Nipsey’s first song to enter the top 10 on the Billboard Hot Rap Songs chart. The song jumped six positions from #15 to #9. “Racks In The Middle” marked the last single Nipsey released while he was living. Its leap on the chart is largely due to streaming numbers which increased by 44% this week. Additionally, it jumped from 14 to 7 on the Rap Streaming Songs chart. What’s even more impressive is that “Racks” has leaped into the top 40 on the Billboard Hot 100. The song is currently sitting at #26 after sitting at #44. It’s also in the top 10 on the Hot R&B/Hip-Hop songs. While the song’s been doing well on the charts, his debut studio album, Victory Lap has maintained a position in the top 10 the Billboard 200. The rapper’s album is currently sitting at #3 after moving 63K units that week. Following the rapper’s death, Victory Lap re-entered the Billboard 200 at #2 while four other projects his — Slauson Boy, Crenshaw, The Marathon, and Mailbox Money — made their way on the chart for the first time ever.